It’s time to get off your beach chair. That’s right. Put your book down and cancel your fruity drink order. It’s time to get moving. We’ll wait while you slather on more suntan lotion and grab your hat. But be ready in five minutes, or we’re leaving without you. 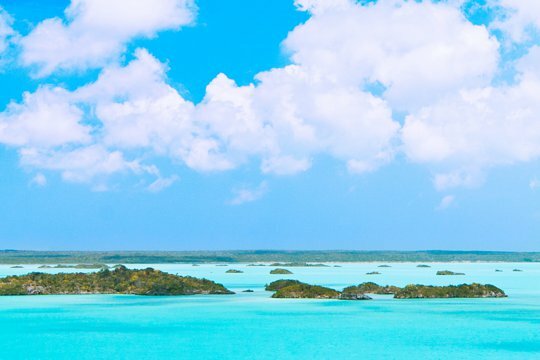 Over the years, the Turks and Caicos have become your go-to spot for a quick vacation. Since it’s just over an hour from Miami, has a gorgeous five-mile stretch of white sand on the north coast, and has yet to be overrun with cruise ships, it’s the perfect place to relax. But that’s all you do. During all of these trips, you’ve barely left your resort, much less Grace Bay. You don’t even know what you’re missing. Chalk Sound National Park, one of the places that you’ve overlooked, isn’t even that far away. It’s located on the southwest coast of Providenciales—Provo as you’ve learned the locals call it—near the airport. It features a landlocked, five-kilometer lagoon, whose shallow water is a shimmering turquoise color. It’s dotted with tiny cays and an underwater cave system. A thin strip of land, which separates the lagoon from the Atlantic Ocean, is lined with a twisty road called Chalk Sound Drive. While the rule that forbids motorized watercraft leaves the park quiet and undisturbed. So, after the drive, what can you do in Chalk Sound National Park? At a nearby resort, you can rent a paddleboard to glide across the calm water. You can search the rocky islets to find little Turks and Caicos rock iguanas, as long as you keep an eye out for poisonous coral sumac. You can snorkel among barracuda, bonefish, a few stingrays, and an occasional small lemon shark. Then, when you’re finished, you can check out another gorgeous beach, like Sapodilla Bay, for views from the south coast. You can return to your beach chair tomorrow.